This is a post of ‘firsts’. Last month I entered my first ever giveaway over at An Unrefined Vegan and for the first time I won something I had entered and now I am hosting my own first ever giveaway! 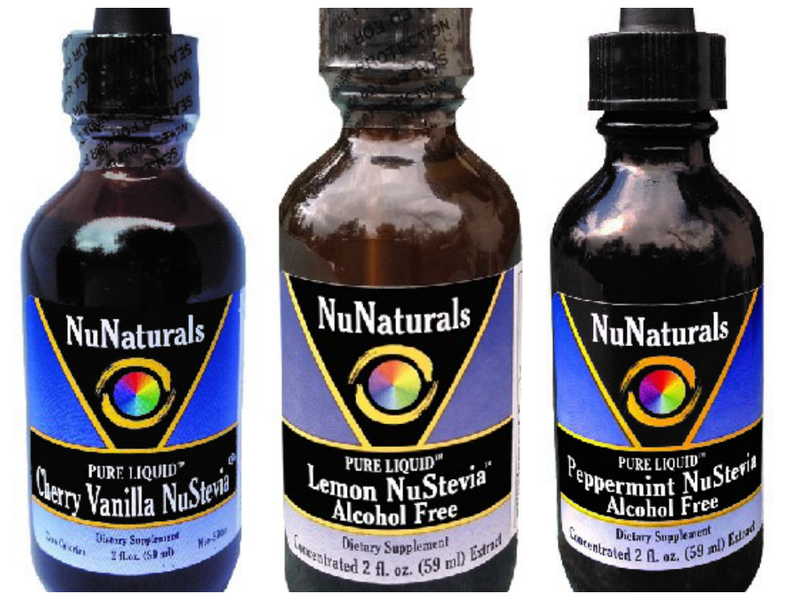 I was lucky enough to win an exciting box of goodies from the very generous company, NuNaturals who make the most spectacular stevia products. I never before realised that different brands of stevia varied in flavour, but now I see that they really do. NuNaturals offers sweetness without even a trace of bitterness, and with exciting naturally flavoured drops like orange, lemon and peppermint, it’s hard not to fall in love. What’s more, NuNaturals make a whole range of products beyond stevia, including the amazing Lo Han fruit based, calorie free sweetener and deliciously nutty, oat fiber. And I have the opportunity to share some of these amazing products with you! FOUR readers will win one bottle of EACH of the Lemon, Cherry Vanilla and Peppermint Flavoured Stevia Liquids, PLUS a 50 packet box of NuStevia White Stevia Powder packets PLUS A FREE BONUS PRODUCT! This giveaway is open to readers worldwide, so go ahead and enter wherever you are! Entry is open until midnight GMT on Wednesday April 23rd. Click the link below to enter via Rafflecopter and make sure to get more entries by following NuNaturals and Bunny Kitchen on Twitter and more! All readers can receive 15% DISCOUNT on all orders placed on the NuNaturals website : www.nunaturals.com until June 30, 2014 by entering the discount code BLG0614 at the checkout page! 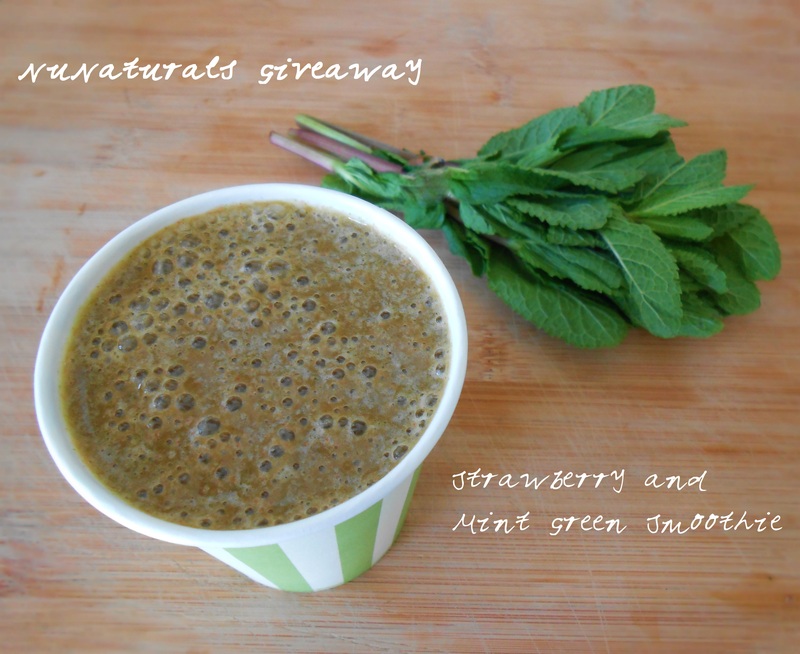 To showcase the wonderful products I have been able to try, I will be sharing a green smoothie using NuNaturals products each day of the giveaway, for 7 days! 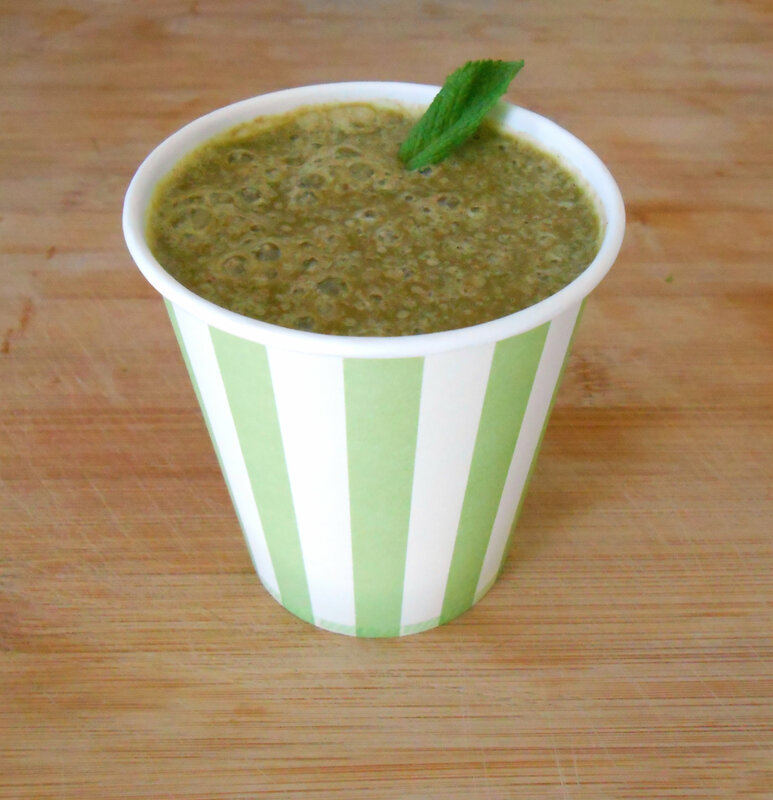 Day 1 is a summery, refreshing, strawberry and mint green smoothie which will really lift you up at any time of day! Inspiration and proportions come from the Vedged Out Green Smoothie Challenge which has me down almost 2 dress sizes in less than 2 months! All whilst indulging in tonnes of delicious plant based foods, from sweet smoothies to creamy dressed salads and huge bowls of steaming soup and unlimited vegetable crudites with a generous portion of cumin spiked homemade hummus. Never hungry, a dieters dream. Simply blend all in a high speed blender until smooth. This entry was posted in breakfast, Drinks, Fruit, raw, vegan and tagged breakfast, dairy free, egg-free, food, fruit, giveaway, green smoothie, healthy, raw, raw vegan, smoothie, vegan, vegetarian. Bookmark the permalink. 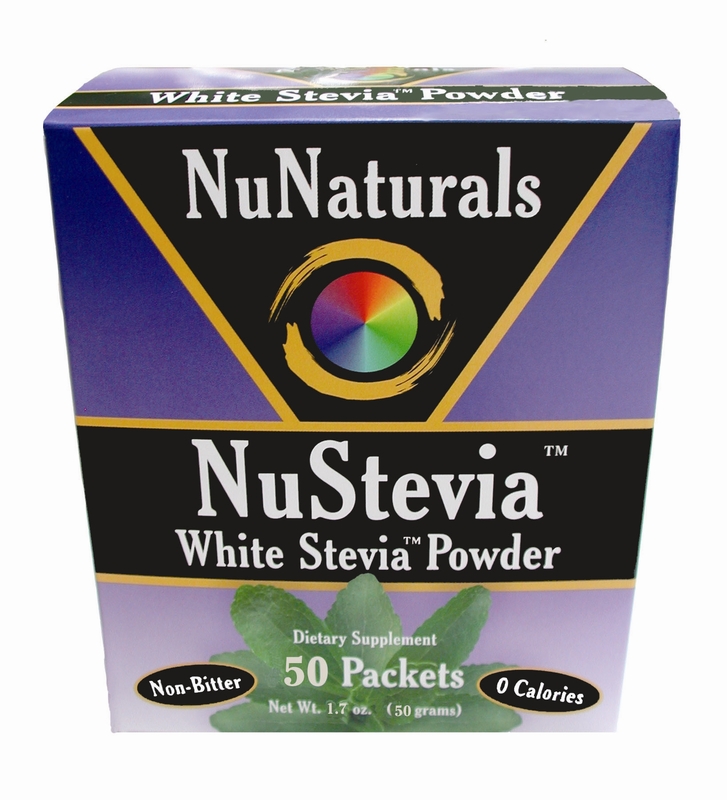 How did the Stevia powder become white? Hi Michelle, as far as I know it is not bleached but I am asking around for a definitive answer to your question. Ahhh, I guess it’s clear that I don’t bake often;) I do wish there were a versatile sweetener that could do all the things we wanted in its natural state. Poppy – so many amazing things going on in this post. 1) I’ve entered, woot woot! 2) 2 dress sizes?! Amazing! 3) Congrats on your win, I also never win anything (wish me luck!) 4) I’m loving the sound of a strawberry minty green smoothie. Sophia, I LOVE your comment!! So excited that you’ve entered and wishing you heaps of luck 🙂 Yes 2 dress sizes, I’m so thrilled!! 😀 I also won Ann’s giveaway! I’m desperately doing research to figure out all the creative ways to use the drops – only last night did I really get my groove with some crazy carrot split. I wouldn’t say no to more nunaturals products – the flavours are awesome! Great smoothie recipe and wonderful that they’ve helped you drop 2 dress sizes. I also ask how they get stevia white. Not sure about this brand, but others bleach 😦 while it might be zero calories, it’s heavily processed to get it white. Thanks April. As far as I know, NuNaturals do not bleach but extract the sweet parts of the plant and mix it with maltodextrin – obviously this is undeniably processed still and I understand it’s not for everyone! I did look in to the bleaching question as it was raised by others as well. The white powder is maltodextrin which carries the sweetness extracted from the plant, there is no bleaching involved with this brand. I believe the green powders are pure ground leaves but this can be bitter so manufacturers extract only the sweetness from the leaves and discard the rest. Looks like not all brands are the same though and I would agree that NuNaturals liquid stevia is the best and least processed! I love green smoothies and have one every day. (Woo Hoo for the Green Smoothie Challenge!) I think my favorites are the tropical flavors (mango, pineapple). I can’t wait until my mint comes up so I can try this combo, it looks delicious! Thanks for hosting this giveaway Poppy! This was my breakfast smoothie today. Holy yum, is it good! 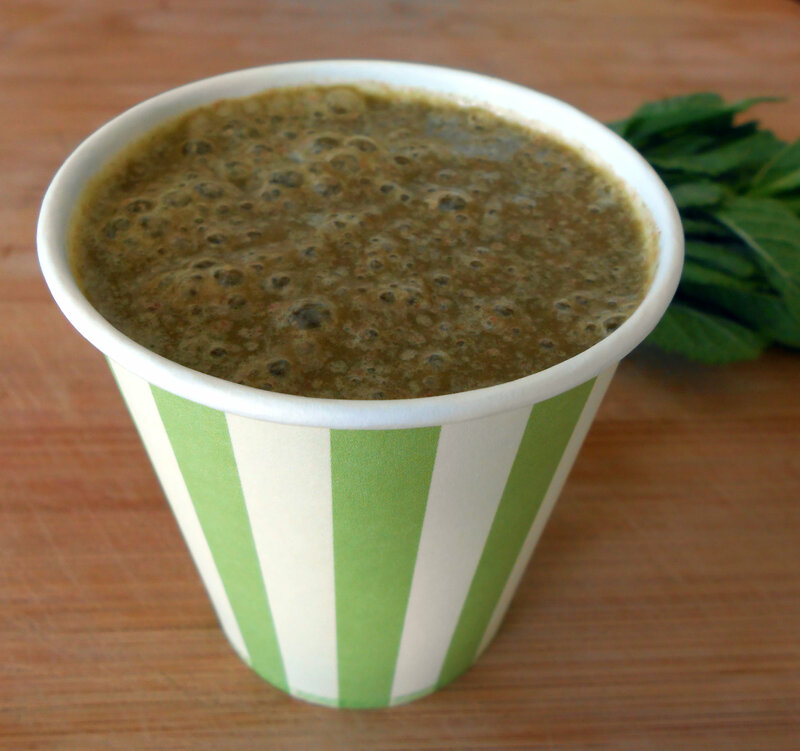 I only have vanilla stevia, so I used more (a handful) of the fresh mint. I have a BIG bag of frozen strawberries that are sour and not very flavorful. This smoothie is the best one I’ve made with them! It’s me, commenting above. I forgot to change the name. There was a slight hint of vanilla, but the mint truly does sing! Having fresh herbs makes me so happy. Just chives and mint up so far, but that’s a good start! My chives are pretty and flowering right now! I love them as garnish! I love fresh herbs too, and it’s great to incorporate them into smoothies too! My favorite green smoothie consists of Power Greens blend,Banana,Pineapple,Mango,Avocado,coconut water, and a scoop of Aria Vanilla protein powder. Yay, Poppy!! I can’t tell you how tickled I was that you won! And I see that you are putting these amazing products to fantastic use! cherry sounds lovely but I dove pineapple with oats! I’ve used fresh mint in smoothies before, and it’s heavenly! Yum! I love the freshness it brings, especially for a morning smoothie, it’s so vibrant!